The Wikipedia article on Macaroni and Cheese mentions that besides the Bechamel (white) sauce base Macaroni and Cheese used in this recipe, it is also made as a baked casserole (in other words, using a custard base of milk & eggs). For the baked custard kind of Macaroni and Cheese, see the recipes Macaroni Pie and Macaroni & Cheese (Baked). Make a roux using half cup of butter (a stick) and half a cup of flour. Add 4 cups of heated milk and stir until smooth to complete the white sauce. Add cheese and cayenne pepper. Finally, mix with a pot of cooked pasta. Fill a pot with water, and add Macaroni and salt. Bring to boil stirring occasionally. While waiting to boil, in pot heat milk, and grate cheese into milk. This should create a basic cheese sauce. If too thin, add more grated cheese, if too thick, add more milk. When Macaroni becomes soft (chef's discretion) drain. Melt butter in pot and replace macaroni (without water). Stir until macaroni is completely covered. Add 1 egg, unscrambled. Stir until completely incorporated. Add cheese sauce, and herbs. Stir well, and serve hot. The cheese sauce used in macaroni and cheese is generally a variant on Sauce Mornay, a french sauce consisting of Bechamel sauce with added cheese. The sauce can be heavily customized so long as the liquid ingredients do not exceed the capacity of the roux to thicken it to a usable consistency. Common additions include white pepper or hot mustard, but Worcestershire sauce or even diluted tomato paste can make interesting additions. Fresh herbs should be left until the end of the recipe, while dried herbs will soften nicely in the cheese sauce. Other possibilities for experimentation involve replacing some of the milk with other liquids, with beer and stock being two avenues of exploration. Of course, the most obvious change one can make is in the types of cheese. The cheeses used in the sauce may be of any sort, however one should keep in mind that at least some of the cheese should be sharp-tasting (lest the sauce be bland) and that some cheeses melt very well (soft bleu, gruyere, cheddar) while others do not (e.g. feta). 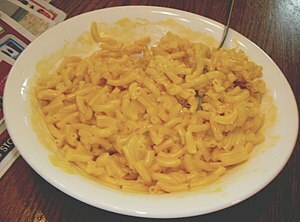 The most common mixture in American macaroni and cheese is parmesan and cheddar, with aged cheddar providing a more assertive flavour which some children may dislike. This page was last edited on 29 January 2016, at 17:07.